Popular Singaporean blogger Mr Brown reflects on our PowerPoint slides at Borobudur. Dmarks at the Throwawayblog discovers an old postcard of Angkor Wat from the earlier half of the last century. The Java Man, dinosaur bones and more are to be found at the Bandung Geology Museum. 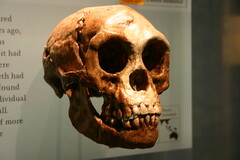 Afarensis takes a swipe at Creationism and Homo floresiensis. Robert Lindsay untangles the genetic diversity of island Southeast Asians in The Peopling of Indonesia. In this series of weekly (at least, it tries to be weekly) rojaks (published on Wednesdays) Iâ€™ll feature other sites in the blogosphere that are of related to archaeology in Southeast Asia. Got a recommendation for the next Wednesday rojak? Email me!